A wood stove may be one of the most important preps for the winter, especially for us northern preppers. Whether or not a wood stove is your primary or backup source of heat, it’s simplicity and readily available fuel source makes it a no-brainer for preppers in a colder climate. 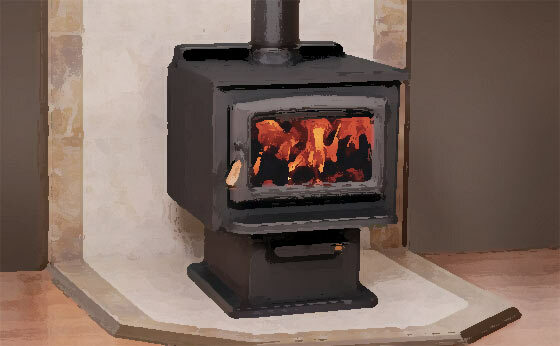 My question to you is this – what is your experience or recommendations regarding a wood stove – lessons learned, things to look for, or avoid, etc.? By the way, I considered a pellet stove (because they’re more efficient, clean burning, automatic pellet feed, thermostat controlled, simpler exhaust) however with regards to real SHTF preparedness – they are not the best choice. They require electricity, they have moving parts, they have electronics built-in, ignitors to go bad, ‘motherboards’!, and they require purpose-made manufactured pellets. While I do have a generator, and I could stock up on pellets and spare parts, I’m not entirely comfortable with having to rely on it’s electronics, electricity, and an external supply of pellets out of my control (SHTF). Instead, a wood stove is simple, they do make them more efficient these days, and I can draw off the wood on my property for fuel. We had one installed last winter – best purchase ever. But get a couple of opinions as to the size (kW output) before you buy. We had 3 opinions and actually went with the middle one and installed a 5kw one. It is MORE than sufficient and anything bigger would have boiled us in the bag. You don’t want one that is too small, but also “less is more”. Ditto on the soapstone. We have a Hearthstone woodstove. Instead of cast iron as the primary radiator it has soapstone panels on the exterior. Not only do they look cool but they also retain and radiate heat for hours on end after the fire has died down. The downside is that when you come home to a cold house it does take a bit longer to get everything heated up. I do wish the ash pan design was different. I don’t even use it, I just shovel out the ashes which is on the messy side. buying one this year. has been in my plans since last year. We are lucky to have several people in the area have wood dropped off for free and we all split it together and store it. I helped them out the last two years and they keep telling me to install one. that is what i am doing next month. I am going with the homedepot ones they are 1/3 the price of expensivce ones and work just as well. I had a contractor price one for me installed and he came back at $4000.00 i priced it out to do it with my contractor friends for about $1000.00 so its a pretty big savings which will likely pay for its self in the first season. I am actually looking folward to the nice heat they put off. I’m an Osburn fan. They have glass windows so you can enjoy the dancing flames, an ash bin that makes for easy clean out of ashes and they’re built like tanks. Osburn and a catalytic on top, can’t go wrong. I have the vermont castings defiant. You can burn with the doors open like a fireplace. (they sell a separate fire screen for this) or you can have the doors closed like a traditional wood stove. Heats our 2000 sq foot home very well. Ahh, a topic with UTILITY, truly! I’ve had an ‘Earth Stove’ for years EXCELLENT investment. It does have blower but functions fine if the power fails. It has an additional excellent feature that we didn’t recognize until the installation. There is a cold-air ‘pipe’ that travels UP the flue a short bit which when the stove is functioning (burning wood) serves to bring an oxygen-rich stream into the final still only partially burned exhaust gas column…this all but eliminates creosote build-up as it combusts the remnant unburned gasified exhaust components before they can precipitate onto the interior of the flue. Very useful…and a safety feature as well! Flue fires are FEROCIOUS and almost inextinguishable once they commence; typically they burn to COMPLETION…and your house goes with THEM due to the extreme temperatures involved. Consider that in any such you purchase; look for it as a feature if available. Also, the stainless steel variety are VERY good, but only IF they are stated to be manufactured from “Authentic Stainless Steel”…ultra low carbon in the alloy, thus preventing the natural tendency of Stainless to WARP when heated. THOSE last forever. Oops….should NOT have READ , “Authentic Stainless Steel”, but instead as “Austenitic Stainless Steel”. This is an an EXTREMELY low carbon content Alloy of Stainless (consisting primarily of ONLY Iron, Chromium and Nickel and virtually nothing else) that does not warp when subjected to heating and cooling cycles. Almost every other Stainless steel WARPS TERRBLY, when so subjected. An additional thought relative to installation is this: PLEASE have the unit installed witrh TRIPLE wall stainless flue pipe…a pipe within a pipe within a pipe, literally. Everything else is a major step DOWN in both longevity as well your SAFETY (re: flue fires…it provides additional critical minutes before incinerating under high heat). This is something that concerns the most important thing in your preps…your SAFETY. Another vote for Vermont Castings (Dutchwest model here). It’s been the sole source of heat for our home for 8 years, and the only maintenance putting a coat of stoveblack on it once a year. Anyone with a wood stove should have one or two of these to help circulate the heat. They are available from many stores. We have two sitting on top of a wood stove identical to the one in the photo at the top of this article and it makes a huge difference to move the air away from the stove in our cabin. they use a peltier junction to generate electricity for the fan motor from the heat of the stove surface. Both are 7 years old and still work like new. Also they are silent. We purchased a “Magnolia” built by US Stove, several years ago. Just by accident I guess, it was a good choice. It paid for itself the first winter. Only drawback, it does have a blower, its necessary, to distribute the heat away from the stove. I would recommend this stove. I normally cut my wood, but even if I purchased my wood, it would save money, compared to natural gas. Early in my life, we purchased an “Ashley” wood stove. It was a great stove. Matter of fact, the family that lives in that house still uses it! I don’t think they make that stove anymore? While, I am not really familiar with these types of stoves. I was wondering if one could put a cooking pan on the top of a stove to heat a meal or boil water…??? Is this possible to use one of these stoves this way…..?? I have cooked a meal on a wood burning stove. Was that the question? Then yes, you can cook and heating water adds moisture to the room. Hi all. I have a woodburning fireplace (with an optional gas starting mechanism) that is more aesthetic than useful in heating the house. My flue lever is broken, and I actually have to prop it open with a brick. Obviously, this prevents any sensible opening and closing based on smoke volume etc. Instead of just replacing this mechanism, I wondered if I shouldn’t just get an insert to make it a more efficient heat source. Does anyone have experience or advice with this? Thanks. Hi Pa Jes, we did exactly that. We built the house with a fireplace, although we enjoyed the openness of the fireplace, we decided to install a wood burning stove insert a few years later. When the installers put the stove in, they actually removed the flue lever. They said that the stove had its own draft control. Ours is a manual lever on the front, some have electronic thermostats. We went with the manual as we wanted as little as possible dependent on electricity. Although it does have an electric fan that forces the hot air into the room we figure that in a worse case scenario we could set up a manual bellows system to move the air. It’s a Regency and its been working flawlessly since we installed it 13 years ago. We heat with wood primarily and use oil as our back-up. I live in central TX. and my house is all electric, back in 03 I was looking for an insert due to power lose. I purchased an insert from LOPI stove co. LOVE IT!!! Insert dors not sit flush w/fireplace, this gives me a 10″ deep 24″ wide cook top. So if I lose power I can still cook, heat house and water, and I get light thru glass door. Last year temp got down into the teens, the living, dinning, kitchen, front hall stayed 80-85 degrees, bedrooms stayed 65 degrees. Stove weighs almost 400 lbs. due to the fire brick inside, and it has a blower which puts out 75,000 BTU’s of heat. I used to live in upstate NY & I had oil heat & wood heat. When oil hit $4 a gallon, wood became primary heat source. I grew up with wood heat in east Texas. Depending on your square footage & home design plan on 3-5 cords a winter. Lay in your wood the year before so that its well cured. I had to use some green wood one winter & it truly SUCKED!!! Couldn’t get it lit, couldn’t keep it lit, couldn’t get enough heat out of it, on & on & on. Get your wood ready a year before & cover your woodpile with a tarp or plywood or something. Figure out a way to keep the wood outside until you’re going to use it. I kept a nights wood inside. I kept a weeks wood on the back porch (covered porch) Make a large airlock next to your stove for wood if you can. If you have carpet, you’ll not like wood heat. It can be messy. If you’re willing to spend the money I would highly recommend an outdoor boiler. The downside is the exposure to technology. I’ve never used a soapstone stove, but some of my friends recommended them to me. For maximum efficiency you can get a stove with a catalytic converter in it. They are amazingly efficient. But they don’t last forever. 5-8 years I think. Might be better now. They’ll still work if the catalytic converter goes bad though. You can certainly heat water or heat a meal on your woodstove. We used to keep a cast iron kettle on our stove to increase the humidity, and we often dropped in a few cinnamon sticks because it smelled good. We live in the Heart of Dixie, so winters are not too cold. Our home is a passive solar home and stays surprising cool in the summers and we have a fireplace for winters. But we plan on getting a wood stove to be used in an outdoor living space that we hope to use as a kitchen if needed and a living space in the winter if heated by a wood stove. We are looking at a Jotul brand stove. Anybody have feedback on Jotul? The Harman TL-300 is the best there is. Make sure you get the optional cooking grill that you can cook steaks on. I dont know much about new stoves and ovens. But I would get a classic “cooking machine” type. With baking oven and a “hot plate”. The “Sidero Classica” is such a thing. So if the effort is no obstacle go for one… if SHTF Type and Brand dont matter much anymore, thats for sure. I have cooked on top of woodburning stoves and inside as well. You can cook potatoes or any vegetable wrspped in foil. I have even cooked steak right on top of hot coals inside the stove. When I was a kid my aunt and uncle had a wood fired kitchen stove and she would make bread and pies in that oven. Love wood fired stoves. We heat with coal much hotter heat hightest BTU of any carbon based fuel source,You cant burn coal in a wood stove but you can burn wood in a coal stove I own a Hitzer made by the Armish stove will last a life time call them you will speak with the owner great company to business with.American coal nothing like it. One last thought here. If anyone is on the fence about woodstoves (or even outdoor wood boilers) I would do it sooner than later. In the past couple years I have heard that the EPA will likely start to crack down on these appliances as they “spew” carbon into the atmosphere. If the EPA does begin to regulate I can bet that the price will skyrocket and their heating efficiency won’t be the same. They will also tell us that you will be grandfathered in if you have a non-compliant stove, but it wouldn’t surprise me if they showed up at your door with a carbon bill or stove registration since you are now contributing to global warming or climate change. Dread the thought…..Stay warm out there, its going to be a long winter! Don’t count too heavily on being grandfathered when the EPA is involved. Look at the headlines just today. I have a bunch of cabins in the mountains that have been in operation since the 1930’s. I got a certified letter from the EPA requesting an “inventory” of my sewage disposal methods. Bottom line, if I have 20 or more guests on my sewer system, I must have an EPA stamp of approval. My cabins are for sale now, anyone interested? I recommend ordering through Home Depot or Lowes as they are less expensive. I have had a Pacific Energy for the past 16 years, still runs like new, clean it annually. Peace of mind is incredible when there is snow falling and/or power goes out. I have a Hearthstone soapstone as well and love it. Sure beats the 1980’s model steel stove I had prior. When it got really cold, like -10 or so, I would have to stay up all night or get up every 1 and a half hours and add wood just to maintain a hot fire. Now with the Castlestone the fire will last a minimum of 5 hours and will put off heat for up to 7 hours. My family and I live in the northern part of the country as well and use a wood stove as our primary heat source. A few things to think about are size of the fire box. We opted for the next model up for the bigger fire box. When I say next size up I mean look into a wood stove that is rated for a bit more than the actual size of your home. Not that you need to burn massive fires all the time, but for the overnight burn you can put lots of wood on and dial down the air. This will allow a good coal bed to remain when you wake up in the morning. That way you drop a few logs into the stove and have heat very quickly. Also I would HIGHLY suggest as a prep and for fun, order a stove with a cook top! This will allow you to cook on top of your stove if need be. These models will have a portion of the stove that’s not insulated with fire bricks. SO not only does it heat the home but allows cooking too, Winning! Fun to make a pot of tea or hot beverage during the winter also, no need for the microwave. A few folks have mentioned fans and such. I have opted to not have a fan installed on our latest stove as they push so few CFM’s (cubic feet per minute) I don’t think its worth hundreds of dollars. Instead a ceiling fan works MUCH better and when the powers out, the stove will still radiate lots of heat into the home trust me. You can use the money you saved on the fan to purchase things that need to be replaced on a woodstove from time to time like the gasket around the door. If the SHTF having a few items like this on the shelf will be a huge blessing as you wont be able to order one online or cruise down to the local store more than likely. other options seem less critical to me, legs vs. pedestal, etc. As for the models, here goes. Lopi has been around for awhile and makes a nice stove, the liberty has a cook to and I believe heats up to around 2,500 sqft. My father had one for maybe 15 years and was happy with it. I have so far owned a Lopi Answer (small stove) with no cook top as it came with the house. It has proven far to small for our needs in our area and has no cook top. I also have zero chance of overnight burn using pine, or tamarack (closer burning to oak than pine). So we were planning to drop in a Lopi Liberty, but have instead gone with a KUMA wood classic. This model has a cook top although not well advertised and is much more robust than the Lopi. The door is more solid, overall weight seems a tad higer (very happy) and it puts out excellent heat. Also its several hundred dollars cheaper than the Lopi model. The Kuma wood classic just looks and feels like a better product. Our Lopi’s have doors that sag and lots of the trim is pressed on or screwed on/in. The Kuma appears to have a lot more welding involved and still comes in cheaper by about $500.00 anywhere we looked. Regardless of what stove you end up with, just try to get something solid with a cooktop and let the fun begin. One more note, it may help you to have the piping insulated and built up like a traditional chimney with stone. This will help with drafting and reduce creosote by keep it warmer. The house I bought had a small Napoleon brand woodstove. While it’s pretty to watch with the glass door and heats the house fine, it’s so small that you can only fit about two sticks at a time in it. When it’s really cold you have to put in a new stick AT LEAST every hour. The fire goes out in the middle of the night and during the day when I’m off at work. What a pain. My parents have a Wonderwood, which I will be buying soon to replace the Napoleon. It’s made so you can cook on top if you have to, and my parents said that it heats better than the more expensive Ashley model they had before. Hi all, just to piggyback on some comments here. Last winter, the gasket on our wood stove (Hearthstone Phoenix) went out during one of those really cold spells we had here up north. I called the stove dealer the same day to order a new gasket, as I was not able to order a new door gasket on my own. They said it would arrive within 3-5 days. We have an LP back-up but with an old, leaky house it was like throwing dollar bills out the window, and we went through LP fast even keeping the house at 60 degrees. Keep in mind this was when LP in our area was almost $7 a gallon and no one around had seasoned firewood to buy – things were looking grim! The gasket took TWO WEEKS to arrive and it took 2-3 days to install it correctly. My advice is to have those maintenance parts on hand, because we all KNOW that something will wear out at the worst time! Get those parts now while you still can! Soapstone only way to go. I have 9 stoves, the best by far is Hearthstone, I have used for sole source heating for years. I have the Mansfield and love it. soapstone is awesome! However if you don’t have a floor that will support the significant weight increase then you will have to look elsewhere. I looked into soapstone as a few friends have those. But with the construction and location of out home it wasn’t an option. Many stoves can be had with “cook tops” I highly suggest that. We’ve had LOPI stoves and almost bought another one, but went with a KUMA instead and absolutely love it. I went with a “wood classic” and another friend has the same one, very pleased. Puts out amazing heat compared to our previous smaller LOPI and looks great in our home. Very well made and……………….has a cook top! So when the power is out, were still cooking with wood. All that said as long as you buy quality and get a cook top your likely doing alright. Suggestion though to you all, buy an extra seal for the door and the tools to clean your own stove should you need too. Also note that an extra stove liner might be a prudent supply to keep on the shelf should you tear that during a deep cleaning. Something else to consider is how you will process would in an powerless situation? Do you folks also stock bow saws and lots of extra blades? How about manual splitting tools? Anyway, food for thought and keep you powder and you wood dry.